My friends and I made a video game. I'm going to talk about it for a bit. Maybe you'll decide you want to play it. It would be nice if that happened. The game is called ZiGGURAT. As of this week, it's available for iOS devices—the iPhone and iPad. It costs a dollar. Today, I'm going to be totally direct. Consider this a look at my professional side. ZiGGURAT is a shooting game. You play the role of The Last Human On Earth. You're standing at the top of a ziggurat. It looks like a mountain. Its top is in the clouds. How did you get there? You don't have time to think: you only have time to realize that you are holding a mammoth laser shotgun, and then notice that waves of cycloptic eyeball-headed blue crystal-skeleton Alien Freaks are jumping in your direction. What you're supposed to do is shoot them. You can't move — you are at the top of the world. Maybe you are tired from the climb. Or maybe you are psychologically broken: this is The End Of The Human Race. Your mission is to either stand there and die or try to take as many of those alien jerks with you as you can, while listening to a pumping symphony of chip-tune progressive rock music. Shoot the Alien Freaks' big eyeballs, and they explode. As the Alien Freaks jump and land and jump again, their eyeballs grow and shrink. As you hold your finger on the screen, your bullets grow and shrink. The biggest explosion requires the biggest bullet against the biggest eyeball. Big explosions envelop multiple enemies. They popcorn-pop in a chain reaction. To aim, slide your finger along the bottom edge of the screen. I like this: the game does not require you to tap your fingers all over the screen. If you're tempted to tap your fingers all over the screen while playing: realize that you don't have to. Our controls track horizontal movement only. Touch all the way on the left side to aim down and to the left. Touch in the middle to aim upward. Touch all the way on the right to aim down and to the right. Slide your finger to change your aiming direction. Hold to charge. Release to fire. Shoot to kill. Play to survive. Tiny bullets plop out of your gun and roll down the mountainside like grenades. Giant bullets fly fast, in a straight line. Of course, what goes up must come down: even the fastest bullets, fired directly upward, will come back to earth eventually. I personally can't think of a way to redesign this game for a controller with buttons in such a way that makes it feel better. Blue Freaks jump up and down. Yellow Freaks crawl up the mountainside with stealth. Red Freaks will appear in a corner, wait a moment, and then fly directly at you. Fearsome Orange Freaks have forcefields—and will be responsible for hopefully as many virtual deaths worldwide as the birds in Ninja Gaiden on NES. Then there are The Big Freaks. You'll have to shoot them a bunch—and they aren't affected by the other guys' chain reactions. And then there are Purple Freaks. Most of our testers can't even survive, most of the time, long enough to see a Purple Freak. What do they do? I'll leave that for you to discover. Blue Freaks, while jumping, occasionally shoot projectiles. A level one or level two charged bullet will destroy a Blue Freak's bullet—and itself, in the process. A level three bullet can cut through multiple Blue Freak bullets, and still land a hit on an enemy. Big explosions might envelop bullets, canceling them out. They can also, of course, cause chain reactions, blowing up numerous enemies in sequence. As you play, the sun in the background sets, and the universe ends. There might even be some surprises: ZiGGURAT is "endless, with an ending". Once that ending comes and goes, you're alone with the mechanics, free to grind your high score ever higher. That is—until The Archenemy shows up. We have a leaderboard for the player who has killed The Archenemy the most times. The game was released last Friday. The champion currently has . . . zero Archenemies killed. The Archenemy might be The Hardest Enemy Ever In An Action Video Game. Should the first player to kill him submit proof to me, that player will earn free Action Button Entertainment video games for life. I feel like we weren't sleazy, weird, or boring at all about implementing achievements or leaderboards. I feel like all of our achievements are about as humble as these things can get: defeat a hundred enemies in one game, defeat a thousand enemies in multiple games, et cetera. One achievement asks you to kill one Purple Freak. Another achievement asks you to kill fifty Purple Freaks in multiple games. I wonder how many people are going to be able to do that? Three days on from release, only one person has achieved that. His total play-time is in excess of eighteen hours. He must like the game a lot! I'm glad to have been a part of something that someone likes that much. In programming our game to track all of these achievements, we happened upon the idea to give players a "stats" screen. This is neat: the game just literally tracks everything. It'll tell you how many games you played, how many shots you've fired—all that stuff. If you like numbers going up, then this could be your favorite feature. There's even an achievement for "Fire 100,000 bullets in multiple games". And it doesn't stop there—you can always go back to that statistics screen between games and see how your numbers are doing. "Before dying, I managed to kill one hundred and eight of the alien freaks who killed everybody else. "In 123 deaths, I killed 4,567 of the alien freaks who killed everybody else." You can purchase ZiGGURAT on the app store for just ninety-nine cents here. Now that I've introduced the game . . .
Now that I've introduced the game—and provided a convenient link for you to buy it—I will go ahead and type a whole bunch about the development process. Maybe you'll find it interesting. Maybe you'd rather play a game (like ZiGGURAT!) on your iPhone! You can do that, too. I'd rather you play the game than read the following Great Wall of Text. If you like the game a whole lot and then decide, "Hey, I want to know a bunch about how this little game was made," then please go ahead and read the following, and when you're done, let's all be friends forever (maybe hug each other sometimes in person, etc). Draw a circle. Draw two tiny dots in the top third of the circle. Draw a little straight line in the lower third of the circle. Make sure the straight line is shorter than the distance between the eyes. You've just drawn an abstract artist's take on my facial expression the first time I played Angry Birds: its brilliance had shocked me into true neutrality. Here was a video game that was unpretentiously all play mechanic and level design, and it was simultaneously, miraculously dripping with money-scented cologne. My formal opinion was, ultimately, that Angry Birds is "the video game we deserve". My informal opinion was that Angry Birds is an incredible collision of game design concepts, and it works. It's got a pinballish sort of recklessness and a Super Mario level of depth. It's a game—like Peggle—in which you make quick decisions by way of a user-friendly one-touch tool rife with nuance. In manipulating Angry Birds' slingshot, the player will, in less than one second, choose just one option from a pool of literally hundreds: how hard are you going to shoot that bird, and at what so very precise angle upward or downward? Players will not hesitate to make these decisions. They'll stretch that slingshot and let it snap, again and again. I'm the guy who stares at a restaurant menu until my date calls her mom or a taxi; I'll sit and stare at my new Skyrim characters for literally an hour before I can dare to start the game. Decisions paralyze; Angry Birds doesn't. I fling those little birds all over. And then there's the core of Peggle: you're making a decision and witnessing the consequences. It's beautiful and delicious: these aren't just video games, they are wind-up toys. Angry Birds is a "wind it up and watch it go video entertainment experience". After launching a bird, you make little secondary decisions, deepening the nuance pool. It's incredible. Past a certain point—after they got the game to feel right (which could have taken nail-biting months)—the game probably designed itself. I say that as the highest compliment. Every third or fourth level of Angry Birds is an Achievement Unlocked in itself. It's glorious. I look at that game, and I think about the money, and I cry a little bit. Way back before I started crying a little bit, way back before the game was on T-shirts at Target, there was me, on a subway train, playing the game for the first time, on the first stage. I slung a bird. It knocked some stuff over. I said, "Okay." I knocked over some more stuff. I said, "Aha." One minute later, I said, "I still don't like the characters." Two minutes later, I wanted a "driving range". I wanted stuff to be falling down constantly, and I'm over here at this crazy distance, slinging birds at it. I imagined a game wherein a hero is against a wall at the end of a long tunnel. Enemies are coming at him. Maybe it looks like Raiders of the Lost Ark. Maybe they're bats. Yeah, that's good: bats. That way, they can be at the top or bottom or middle of the corridor, and flapping and flopping in irregular paths. So you use slingshot controls to fire these for-some-reason-very-slow-moving bullets at these bats. You have to sit there and watch the bullets approach the targets. You have no limit to bullets you can shoot. Depending on your firing angle, you can sacrifice speed for accuracy. Speed knocks the bats back further. You're just—keeping a bunch of bats back. Okay—there it is. That's a video game. I put it into the idea vault. A year later, I was sitting next to a guy on the Bay Area Rapid Transit headed from Oakland to San Francisco. I wouldn't have been sitting next to him if there'd been any other seats available. He stunk like Aqua Velva and Listerine. He was playing Angry Birds. I couldn't help staring at his phone screen as he played Angry Birds. He was playing one of the expansions. He was a seasoned pro. He played like this—maybe you've seen this, or played like this: he flung a bird; he let it fly for two seconds; he made a little sound in his nose; he tapped "pause"; he tapped "reset". This process repeated a dozen times before he let that first bird land. Then he fired another, was dissatisfied with its arc, and reset again. This was a stage he had cleared already: he was trying to clear it better. So, again, refer to the abstract cartoon you drew of my face. I remembered my Bat Game idea. And I thought, "Maybe I should make that." I told my friend Adam "adamatomic" Saltsman, creator of best-selling iPhone game Canabalt and Flixel, the Flash library used to make Canabalt, that I had an idea for a game and I wanted to try making it myself. I said I thought Flixel was right for me. He encouraged the decision. I tried to make my game. An hour later, I had made no progress. It was that thing that hangs me up all the time when I'm trying to learn some aspect of programming: within the first six steps of a tutorial, the tutorial will reference a preferences menu check-box which just doesn't exist. Or it'll spend twenty steps explaining how to install an IDE program, and then, in step twenty-one, say, "Okay, now program your game!" Or it'll be like "This is a tutorial for absolute beginners wishing to learn to program in Flash." Then, in step twelve, it's like, "Of course you're intimately familiar with C++." All my previous experience making games had been in an environment surrounded by dozens of people who knew what they were doing and for some reason listened to me when I had ideas. I decided it would be in my best interest to find some of those—who also weren't on the clock and making Big Dollars to listen to my suggestions. How did I do this? Well, it's a Web 2.0 Miracle: I tweeted. I said I wanted to make a game. A couple of people contacted me. Nobody ended up making a game with me. I ended up meeting Bob "Bob's Game" Pelloni at the Game Developer's Conference in San Francisco in 2010. We started making some games together while I continued my work as a consulting game designer. At one point, while we were working on a game I'd been calling ZiGGURAT, we decided we should be auditioning artists. I tweeted into the void: if anyone wants to be the Action Button Entertainment official artist, please submit a fan art of the Japanese box art of Phantasy Star II. One gentleman answered the call in under an hour, and his submission was incredible. He was Brent "Porterhouse" Porter. It turns out he's also a programmer, a musician, a painter, and a 3D artist. He's now a founder of our company. Ultimately, in the summer of 2011, we decided we wanted to make an iPhone game to distract us from our Much Bigger Project for a couple weeks. Bob was against the idea, because iPhones don't have buttons, and he believes buttons are necessary for fun—and besides, we have "button" in the name of our company. I was certainly not against making a game with no buttons. I didn't have much time for it, between the balancing work I was doing for mobile applications and other assorted consultation work, though I wrote up a document and we all looked at it and thought, "Oh, that's kind of cool". Who was going to make it? We didn't know. I remembered that Some Kid From The Internet had emailed me once, about a game design concept I threw out during a column on Kotaku. The basic idea was that it was sumo wrestling with the graphical presentation of Pong. This Kid From The Internet had actually mocked up the game in Unity, and it was fun. I asked if he wanted to finish it. He said he was busy in his last semester of school, so I let it drop. It had been a whole bunch of months since then—and summer was well underway. Maybe I could ask him again? I asked him again. His name was Michael Kerwin, and he is incredibly, capably responsible for turning my tiny idea into an actual game. About a week after he said he'd do it, we had ZiGGURAT. It didn't have any graphics, or sound. Soon, it had graphics. I jammed out some insane and rough music with my band, sent various scraps to my spirit brother Andrew Toups, and he somehow wove together a perfectly composed original eight-bit symphony of sound—in the original Nintendo sound format, even. The music was breathtaking. I had it on loop in my home for several days, during which every person who walked into my living room stopped and asked, "Oh man—what game is that from?" Or "Wow, I feel like I've played that game before" or "I know this is not from any existing NES game, because no NES game was precisely this awesome". Once that music was in there, the game started to sort of feel like something. So there was our game. It was a playable little thing. I showed it to my friend Bennett "QWOP" Foddy, who deemed it sort of interesting. Six months disappeared, during which I went on deciding how much real-world money fake-world brick-wall segments—or the luxury of removing a purposely unsightly rock or weed from a fake-world garden—should cost a social game player. I was sick of the social games thing—I found the whole thing ugly. If any aspect of games development is better called a "racket", it's social games. I still had ZiGGURAT on my iPhone. I looked at ZiGGURAT, with its depiction of a world ending and a lone hero standing atop a mountain, fighting off wave after wave of alien marauders as a genuine piece of amazing music plays, and I thought—listen to that music. It's perfect. It's incredible. I listened to it in earbuds. It felt amazing. Why can't the game live up to this? We could put in more enemy types. We could map a progression. We could make something incredible happen in the background. So, with a few emails, the band was back together, and the painful process of turning a surprisingly robust prototype into An Actual Game worthy of my own deepest, harshest critical sensibilities began. I will not say that I am satisfied with ZiGGURAT as a game critic. I will, however, say that by seeing this process through to the end, I know how best to begin the next endeavor. And there will certainly be another endeavor (and sooner than you think): by now, we are all spirit brothers—whereas before, if you're keeping score, it was just me and Toups who were spirit brothers—and during the making of this game a dozen fantastic ideas fell out of my head, and so we are brimming with confidence and uncontrollably exclaiming "Yay" every thirty-ish seconds. Let's go back to the part where I said the process of turning this iPhone application fom something Bennett Foddy had called sort of interesting into something he today calls a great video game. That was "painful": it was, for at first, all I could suggest to programmer Michael Kerwin were mathematical tweaks based on a gut instinct of the way such a volume change would feel. Then, one day, on accident, me and Bob were laughing it up about the latest achievements-monetizing start-up, saying we could make a game that requires Mountain Dew to play and nets the player free Mountain Dew for playing it well. A minute later, I was sincerely thinking about Hamburger Moments—feats of game-playing dexterity so intricate and simultaneously achievable that you'd imagine a fast food chain gladly awarding a player a "buy one hamburger, get one hamburger free" e-coupon each time they nailed the feat. Today I come to you with, in the palm of my hand, an electronic package full of Hamburger Moments. It's also a fun game. Maybe you'd like it. I'd like it if you were to play it. ZiGGURAT is a music video. This is an idea I pitched to Goichi Suda many years ago, while I was working at Grasshopper Manufacture: let's make little 3D action games that are, essentially, music videos. Let's sell them on the PlayStation Network or Xbox Live Arcade for three dollars each. Let's get Masafumi Takada to do amazing music. Just one track. Here's an idea: the player plays the role of a man whose wrists are cuffed behind his back. His wrist-cuffs are tied by a chain to a post in the middle of the floor. Okay, at the beginning, we see the man's face as the camera fades from black. He's a ‘Fist Of The North Star' sort of guy. He's chained up to a post in the middle of the ground in a dirt pit. All around him are shutters. He wonders . . . "Where am I?' Then the shutters fly up. Screaming crowds and monstrous people. The music begins to pump. Thugs with baseball bats come streaking toward him. Let's call the game ‘KICKMASTER'. This guy kicks at these freakish thugs. It controls like an FPS. The music is huge and loud. The graphics are just some leftover brushed-up tweaked No More Heroes models. So you kick guys and they ragdoll into one another. You hold the trigger and then let go. Pinball kicks. Shotgun kicks. Kick with the left trigger or right trigger—left leg or right leg. Just kicking to the music. Just relentless action. The longer you survive, the crazier the freaks become. Maybe they have different weapons. Maybe you can kick a spiked baseball bat out of one guy's hand, and if it hits another guy, he'll go flying. Maybe if you kick a guy right in the torso, his torso explodes out of his body like a projectile, slamming into a bunch of other dudes, blowing their arms off, as the original guy's arms fall onto the ground. And the music keeps pumping, and changing—the music is a genuine piece of pop art." "What are the mechanics? How does your guy die?" "He dies if a single enemy touches him." Suda made a concerned facial expression. "I don't know if people will like that." "Is that cappuccino cup in your hand full of espresso?" "It's a good idea—I've got a dozen more just like it. People would love it. We can mock it up in Unreal in two hours." "A dozen more, huh? . . . Write up twenty, and let me see them." Ultimately, teaming up with Electronic Arts to make a triple-A shooter seemed like a better decision: people loved shooters, and Electronic Arts has a lot of money. Looking back, I feel like I could have pitched the one-hit kill a lot better. I could have said it was like Tetris—you're trying to keep these guys away: closeness represents danger. I could have said the enemies throw projectiles (beer bottles? baseballs? ), and the game kicks into slow motion while the player retains full control speed with which to aim a kick and fire it off. We could have talked about the presentation of death: the music should be of such urgency that cutting it off anywhere, with an instant snap to freeze-frame and breathless snap to red, would feel thematically consistent. So, years later, here's ZiGGURAT. Unlike Tetris, the fear of death does not creep in. It arrives with immediacy. 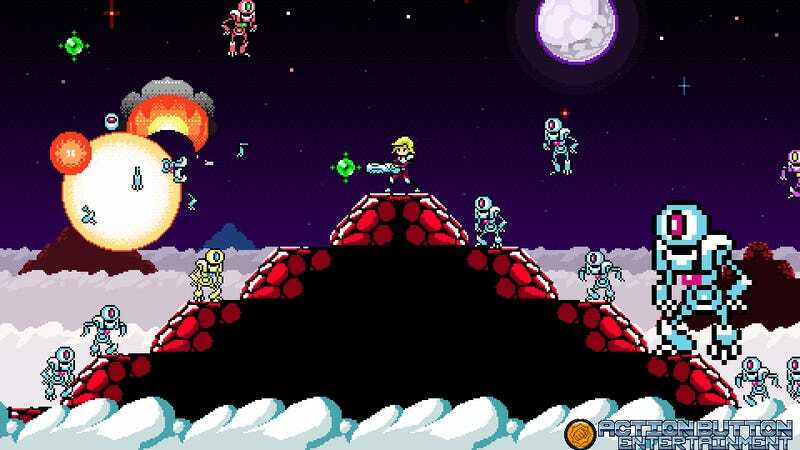 Suddenly, you'll find the screen full of enemies and projectiles, and you'll feel hopeless for an instant. Except there is no such thing as hopeless: at any point, one shot is all you need to clear the whole screen. It's just a matter of whether you are a tough enough super-player to take that shot and make it. It took hours of tuning to make sure that shot is always available. And so, at the end of the day, we had a game where, if we tested any one key-frame on the difficulty ramp and could survive for more than ten seconds, we had us a game that someone could absolutely survive forever. It's just a matter of holding on. And if you die, so what? You can start over. And then, in the final weeks, I realized that the Action Item I'd been ignoring at the bottom of my list was now at the top: "Scream sound effect", it read. Notice I'm playing different notes of different lengths. These would later be combined (with some drum and other sounds) and "crushed" to give a more distorted, eight-bitty kind of digitized feeling. I felt it was necessary to make the ending break through the wall of the chiptune soundtrack by bringing in sounds of a slightly realer world. "That sound. Holy moly, that sound," my friend Doug Jones said, after I played a round of the game on my iPhone in his kitchen in Indiana the week before Christmas. "What on earth is that sound?" "That's . . . it's a guitar." "Hey, I have entire record albums by eccentric Japanese musicians who make sounds like this repetitively for an hour." "You're also kind of a weird guy." "Well, seeing as this is a game about the Last Human Alive and The End Of The Universe, and since the game only ends when the player dies, I figured it would be thematically consistent if the presentation of death was a sort of pop-art project in and of itself." "I guess it'll make people not want to die!" ". . . There's that, too." Here's where I doubted our game for the six millionth time. Is it too morose to make a game about death? Tetris is about death, in a way, though it's at least courteous enough to only star geometric shapes and not feature any abstract human scream sounds. Well, the aliens in ZiGGURAT have big eyeballs and are kind of cute in a murderous way. You could make little plush toys out of them. Here's where I doubted our game for the six-million-and-first time. Katamari Damacy is the cutest game on the planet and it still manages to provoke morose emotions in me: that last stage, where you grow to an enormous size, lolling fat and alone in the middle of the ocean. Why didn't we make something like that? I want to make something like that. Or I at least want to make something like Noby Noby Boy, a Rubik's Cube with no end goal—just a thing to twiddle and feel like you're accomplishing something, until you realize that you're just going to die someday anyway, so maybe that's why this intelligent, thoughtful man made his game look so cute and pleasant. And here was our game—a chunky soup of cute and strange, its soundtrack flopping between tweety and morose, its sound sometimes so loud you'll claw the earbuds out of your ears, its characters weird, its colors primarily primary, and its plot focused squarely on death. What a weird little thing we've made. Well, hey: the gun feels good. The gun feels great. That's what I want in a game: I want a gun that feels great. Just a few days since its release, people keep asking me why there isn't a pause button in ZiGGURAT. The short answer is that I am a jerk and I don't want a single non-game-world object on the screen. The long answer is: you know how, sometimes, in a really intense game (think about Contra), you'll pause the action, and then die immediately after you resume? ZiGGURAT is that game, put into a blender, whipped into something drinkable. Other players complain that the first thirty seconds of ZiGGURAT are too slow-paced: this is, I assure you, only in comparison to how awfully hectic the game becomes by the end. To endure five minutes of gripping dread, die, and then have to start over from "the easy part" is not the easiest break, psychologically. The game would be a thousand times easier if it started out as intense as it ends. Trust me—also trust me that the game you may be playing may actually, in fact, be only the tip of an iceberg. What if I told you we have nine hours of scripted events hidden away in that game? We've given this game more than any player will ever see. The Archenemy is only the beginning. It goes like this: if the end-game is tuned in a way that I personally can survive for thirty seconds from a cold open into the end-game, then the nine-hour experience is balanced. Who will survive it? They say you can never underestimate the player. We've tried very hard not to do that. Katamari Damacy recalls the joy of rolling a ball; Noby Noby Boy recalls the joy of stretching something flexible. It took vision tantamount to artistic vision to identify love of those frictions and then turn them into games. The iPhone strikes many as an opportunity to make an application which is about a small friction. Remember "iBeer"? It was a simple application for the iPhone—the screen fills with virtual beer. Tilt the phone, and it empties, with a liquid pouring sound effect. Well: okay. The guys who made that made a million dollars. I remember seeing that, and thinking, "Someone will make a bubble-wrap simulator next." Soon enough, there it was: virtual bubble wrap. I felt sad for a moment, because real bubble wrap isn't just about result: it's not about just the sound, and it's definitely not about the graphics: it's about the joy of the friction—of actually feeling that air-filled plastic under your fingernails. Bubble wrap on your iPhone is just a noise-making toy. It assumes that because we enjoy something, we must love any set of two of its elements (which excludes at least one other element) enough to pay Real Money for it. I wasn't sad for too long: I eventually remembered that people who are happy for a moment will likely promote the idea of others being happy for a moment; we might as well keep all these happy thoughts floating around. And so five years—five years!—have passed since the appearance of the iPhone. As far as I can see, half of the people working creatively seek to make memes because memes make people happy; the other half want the fortune and glory. I remember that Shigeru Miyamoto had only ever wanted to be a toy designer. The videogames he helped make—and I mean this in a manner most awestruck with admiration—could not be just toys, because they were busy learning to be technology first. Unlike every other games start-up in Northern California, I don't want to be The Next Zynga. (Not on purpose, anyway. If a billion dollars comes knocking on my door, it's fairly likely that I'll tell it it has the wrong house.) I just want to make fun things on my own quirky terms, and by doing so earn sustainable enough income to afford a 2013 Subaru STi hatchback and a prostatectomy at some point in the near future. I see mobile phones as an opportunity to make Genuine Little Toys which happen to be games with rules and possibly even little worlds whose stories you feel at a glance. Their being electronic is a coincidence. I intend ZiGGURAT as a casual little snow globe of an electronic toy, and simultaneously as a gosh darn air-tight hard-core video game owing much of its soul to all things Super Nintendo and Sega Genesis. Shigeru Miyamoto also once advised players who had played all of Super Mario Bros. to try attaching made-up, whimsical restrictions on yourself: try completing the game without collecting a single coin, for example. Shigeru Miyamoto invented Hamburger Moments. They say Shigeru Miyamoto designs games based on his hobbies. I want Action Button Entertainment to base our games on our hobbies: our hobbies are identifying great things about great video games. Shigeru Miyamoto talked about gardening; years later, we had Pikmin. Anyone who could have heard Shigeru Miyamoto was enjoying gardening and then designed Pikmin ahead of Miyamoto could just as well predict lottery numbers. Now Nintendo forbids Miyamoto from talking about his hobbies in public. I'm going to tell you what I like, and then I'll tell you why: I like Ibara Black Label. I also like Rubik's Cubes. There's a right way to solve them. No Rubik's Cube is ever more than nineteen moves from solution. Many people don't know how to solve a Rubik's Cube. They do, however, love the feel of its plastic and know by heart the iconic quality of its shape and colors. I want to make games which are the holy offspring of Ibara: Black Label and a Rubik's Cube. I think ZiGGURAT is one such game. We've got another one coming shortly afterward—and then another, and then another. It looks like we're ready to keep making games—slightly bigger and slightly better, one at a time. Polished bags of electronic popcorn. And I promise—I promise—we'll never make anything with a zombie in it. And then, one fine day—we'll have the funding we need for me to finally make that triple-A open-world action-adventure beginning on a street basketball court in Chicago of 1994 . . . and ending with the NBA Finals.